Hugh J. Monson was born in Northern Missouri, in Lynn County, December 30, 1878, a son of Samuel T. and Mattie (Squire) Monson. His early environment was shut in by the duties of his father's farm and by a few months each year of attendance at district schools. When fourteen years of age he went to Columbus, Ohio, and it was there for several years he paid his way by working for his aunt, as clerk in her small store. In 1897 another avenue of work, though hardly a promotion, was presented when he became a bell boy for the Southern Hotel of Columbus. In the spring of 1898 Mr. Monson responded to the call of patriotic enthusiasm and enlisted in Troop D of the First Ohio Volunteer Cavalry. Later he was transferred to Troop G. He was with the volunteer forces for eight months, and on returning to Columbus he and his cousin, Dwight Shannon, bought a horse and wagon and for a year traveled about the city and surrounding territory selling candy to retail merchants. He left this to become a roustabout employee of John W. Brown & Company, lamp manufacturers. From casual duties he was assigned to a bench and learned the lamp making trade and followed it three years at Columbus. The next year he spent at Richmond, Indiana, with the Richmond Manufacturing Company, also as a lamp maker, and after that until 1907 was a lamp maker for the Badger Brass Company, manufacturers of automobile lamps, at Kenosha, Wisconsin. Mr. Monson came to Cleveland in 1907, and with William F. Persons and William Bunce established the Guide Motor Lamp Manufacturing Company, with a small shop on East Fourth Street between Prospect and Euclid. It was hardly a business which attracted much attention in those early days. They were equipped with facilities and experience to manufacture automobile lamps and do a general repair work, but the partners themselves constituted the working force, and there was no pay roll and for a year or so very little need for bookkeeping. In fact it was the hardest task of Mr. Monson's business experience to succeed in interesting people in his product. The first important order received, and the start of their business prosperity, came from the Rauch & Lang Electric Motor Car Company, and the Baker Electric Company. These companies assigned them contracts for making a few dozen motor lamps, and after that the way of prosperity was considerably smoothed out. In May 1913, the business was incorporated, and since then Mr. Monson has been president and general manager, with J. D, Kauffman as secretary and treasurer. Cleveland has been recognizing and taking some account of this growing industry during the past five years. At the time of incorporation the firm erected a two-story building on Madison Avenue between 114th and 115th streets, furnishing 12,000 square feet of floor space. In 1915 a one-story addition adjoining on 115th Street was made necessary, in 1916 they doubled this by making it two stories. This furnished 5,600 more square feet, but in 1917 another one-story addition was placed on 114th Street, giving 3,900 square feet. These building additions serve as an index to the growth and development of the business itself. The company manufactures a general line of automobile lamps, and now furnishes these accessories to a large number of Cleveland automobile factories, and to many companies in other cities. One interesting contract recently handled as an initial order, was to furnish lamps for 2,500 of the Liberty trucks for war purposes. The volume of business done by the company in 1917 aggregated fully $300,000 and 115 men are now on the payroll. While Mr. Monson has given the best energies of his years to creating and building up this business, he is also a director in the Blue Serge Stores Company, and a member of the auxiliary board of the Security Savings & Loan Company. 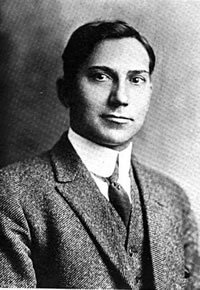 He is active in the Cleveland Chamber of Commerce, the National Chamber of Commerce and in 1915-16 was a director of the Cleveland Association of Credit Men. He is a member of the Cleveland and National Society of Auto Motive Engineers, of the Ohio State Board of Commerce, the Automobile Club, is an honorary member of the Pen and Pencil Club, of the Wolverine Automobile Club of Detroit, the old Colonial Club, and is affiliated with Brooklyn Lodge, Free and Accepted Masons; Cleveland Chapter, Royal Arch Masons; Knights of Pythias and the Royal League. In politics he is independent. On January 23, 1901, at Columbus, Ohio, he married Mary Werner. They have four children, Helen M., Margery E., Genevieve F. and Hugh Talbot.